The statue of Aphrodite of Milos, which was discovered on April 8, 1820, changed western culture in the 19th century, creating a certain ambivalence about the idea of female beauty. Aphrodite – the goddess of love for ancient Greeks – had been depicted by artists of that time as a woman of exceptional beauty. The Aphrodite of Milos statue is one of the most beautiful interpretations of the goddess and is believed to be the work of sculptor Alexandros of Antioch. The nineteenthth century was a time when artists and writers were rejecting the perfection and the timelessness of classic art. 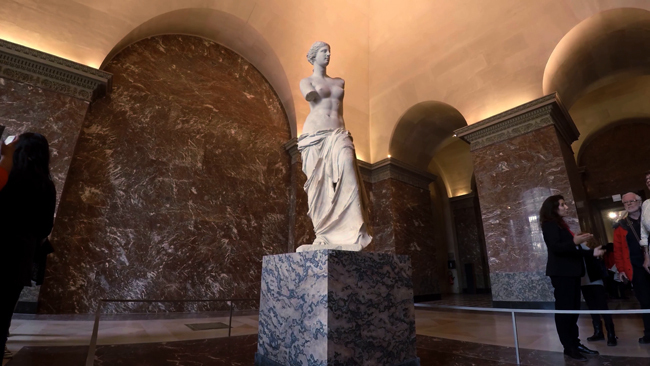 The statue of Aphrodite of Milos – or “Venus de Milo” as it is known by many – embodies the modern world’s ambivalence toward classical beauty. The existing enigma of what Aphrodite’s hands were doing has also been a subject of extensive study and countless interpretations since its discovery. Goddesses Hera, Athena and Aphrodite all staked claims to the apple. Zeus refused to act as judge, declaring instead that the mortal Paris of Troy would do the job. All three goddesses tried to bribe the mortal judge, but Aphrodite’s bribe – Helen, the most beautiful woman on Earth – won. The statue is thought to depict Aphrodite admiring her prize. So, in essence, the statue of Aphrodite of Milos shows the results of a beauty contest, the first in Western Civilization. Several art historians, academics and artists have claimed that the beauty of Aphrodite of Milos lies in her missing arms, i.e., in her very imperfection. Salvador Dali created the “Venus de Milo with Drawers,” a half-size plaster reproduction of the famous marble statue altered with pompon-decorated drawers in the figure’s forehead, breasts, stomach, abdomen, and left knee. Yet in so many ways, and for many artists, the perfect harmony in body proportions and facial features has shaped the idea of female beauty since the discovery of the marble statue. According to experts, the Aphrodite of Milos inspired women of the nineteenth century and the early twentieth century to aspire to an unrealistic ideal of beauty. These unrealistic beauty standards conveyed to the public propelled the modern cult of beauty. Modern society places a high value on physical appearance, and beauty has become a factor in determining worth. Beauty pageants in particular propel the convention of judgement based on appearance. Examining the standards of beauty in ancient Greece and comparing them to current beauty standards, it can be argued that despite the passing centuries, beauty standards have remained remarkably similar. The main similarity lies in the belief that there is a single ideal of flawlessness to be achieved. With or without arms, the symmetry, proportion, and harmony found in the Aphrodite of Milos have been essential elements in our determination of beauty. The day of April 8, 1820 found Milos Island farmer Giorgos (or Theodoros) Kentrotas digging in ancient ruins in his field in order to unearth some stones he needed. Kentrotas instead found pieces of a marble statue which turned out to be one of the most famous statues in the world — the Aphrodite of Milos. Providentially, French naval officers happened to be conducting excavations for ancient artifacts nearby at the very same time. When the pickax of the Greek farmer hit something unusual and he dug out a piece of a marble statue, two French navy sailors who were participating in the excavations took notice. Kentrotas sensed that his discovery was valuable, and tried to place the dirt back over the marble statue again, fearing that the French would take it. However, the French were not fooled by the farmer. They gathered around his digging spot and urged him to dig further. Kentrotas complied and kept digging until all the pieces of precious marble were unearthed. The fragments of the sculpture were moved to Kentrotas’ sheepfold, while the French had already begun to communicate with consuls and ambassadors of their homelands in the cities of Constantinople and Smyrna. French naval officer Olivier Voutier was in charge of the excavations for antiquities on the island of Milos. He had studied archaeology, so when he saw the discovery, he realized the immense value of the statue and informed his compatriots that he did not have enough money to buy it. Along with the Aphrodite statue, the French discovered two dedicatory plaques and a base plinth with an inscription of the name of the sculptor. The missing arms of the statue were oddly never found. The French began official negotiations for purchasing the Aphrodite of Milo statue soon after its discovery. The initial price offered was 400 piasters, known in Greece at the time as grosi (γρόσι), the currency used by the Ottoman Empire until 1844. Other parties then entered the negotiations, making procedures more complicated. The Ottomans and French Admiral Jules Dumont d’Urville made competing offers for the priceless antiquity, which resulted in the delay of the transfer of the statue to France. The French finally won, and the surviving pieces of the Aphrodite of Milos were safely placed aboard a ship to be transferred to France. The beloved statue has been displayed at the Louvre Museum ever since.